Last Friday commuters on Lake Shore Drive were met with a surprise when portions of the drive were covered in water. Motorists were urged to take alternate routes and to drive carefully. High winds and waves as high as twenty-three feet were the cause of the flooding. 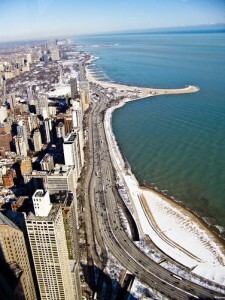 The worst hit area was Lake Shore Drive between Oak and North Avenues. The North bound lanes of the drive were reduced to one lane as commuters slowly drove through the flooded areas. In a few stretches the water even reached the South bound lanes. While amazing to watch the waves it’s important to note that if you are driving and encounter water on the road you need to proceed with extreme caution. In the video you see the cars are all going very slowly and carefully through the affected area. Now if you come along an area of the road where there is standing water and you are unable to tell how deep it is it’s best to play it safe and find a different way to go. This is because if the puddle is too deep and reaches the air intake you could flood the engine of your car and end up stranded and potentially have costly repairs. The flooding this past week wasn’t the only time during the past few years weather affected Lake Shore Drive, during a winter storm 2011 the drive came to a standstill as cars and even buses got stuck in the snow. During this storm snow was falling too fast for the city to keep up with the roads and it got to the point they advised drivers to leave their cars on Lake Shore Drive. It took city works upwards of twelve hours to rescue all motorists and bus passengers from their vehicles, even with many motorists abandoning their vehicles before the city workers got to them. The video below shows what Lake Shore Drive looked like the day after while city workers were still in the process of removing all cars and snow from the drive. A very important lesson to take from what happened on Lake Shore Drive during that snowstorm is even if you are only driving around a city, such as Chicago, you still need to have a winter emergency kit, keep your gas tank full and be prepared to rescue yourself. Winter driving guidelines aren’t just for people who live in rural areas and being prepared for winter is part of being an intelligent driver. If you aren’t sure what to do to prepare for winter check out our blog article on how to Winterize Your Car. This entry was posted in Top Driver Blog and tagged Car Safety, Emergency Kit, How to Drive a Car, illinois, Lake Shore Drive, Road - Side Emergency Kit, Road Safety, Safety Tips, Winter Driving.